Dropping a few animated smiley faces in your chat messages, blog posts, or even as part of your website can give it a friendly feeling. 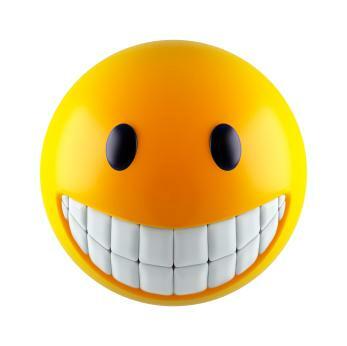 The icon of the smiley face was popular long before the Internet, and it's only getting bigger. The origins of these little friendly "emoticons" are in the early graphics of the web. Animated GIFs were very popular ways to illustrate websites, and a simple yellow circle with a few tiny lines drawn inside made for very small files. They were small enough that chat engines such as Yahoo Messenger began to include them as features for their users. Of course, just using them inside of the chat message wasn't enough, so people began sharing small animations to download on the web. There are probably millions of places to get animated smiley faces on the web. However, as some of these are well over a decade old, the images look a bit dated when put into a modern website. For example, while it has a great variety of icons, and even includes the HTML, forum, and URL codes for each animation, the tiny size and low resolution of the icons on FreeSmileys.org would only be appropriate on a "retro" site. GetSmileyFace.com has a wider variety and somewhat larger icons. For example, there's an entire Japanese themed gallery of smiley face icons and a gallery with monkey faces making various expressions. These actually go a step beyond the animated GIFs, since most of the monkey heads are actually photos (or photos combined with some creative drawings. GetSmileyFace doesn't make the code as easy to find as FreeSmileys, but it's not very difficult. You simply right click (or, on a Mac, control-click) on the image and select "save image as" to download the picture to your computer. Some web designers or bloggers might instead select the "copy image location" option, but that is not really very good practice. For one thing, if you're not storing the image on your own server, you are stealing their bandwidth, and for another you are running the risk that if they change or delete the image, your own site will lose the image. Why are smiley faces so useful? Part of the explanation goes back to the fact that the web was originally text-based. Text is great for conveying information, but sometimes the subtleties of tone and emotion can get lost. Originally, the use of a colon and a right-parentheses was used to show a sort of sideways-smiley face like this :). As more and more people used this and other emoticons, the expression became so commonly understood that people would even use it in their everyday correspondence. By using the smileys, you are harnessing a kind of universal, multicultural understanding of symbols, as well as using very creative ideas to convey emotion. Sites such as Animation Playhouse give you an idea of the multiple sizes and animations that are available, all with the same theme of a smiley face - from a band of tiny pac-man style faces rolling by to a psychedelic sunflower smiley. SmileyCentral is an example of another source of animated smiley faces, but it's a kind that you may want to be careful of using. The application is used to install a special function in your web browser that allows you to insert a very high-quality animation to whatever email you use. While this particular add-on seems to be legit, some of these add-ons use the popularity of emoticons to install viruses and malware on your computer.However, many email and chat programs don't require such a software installation. For example, typing ":P" in a Google chat will automatically change to a smiley face animation of sticking out your tongue playfully. Whatever style you decide to use, smiling, frowning, or just being silly, these universal symbols strengthen communication on the web.